In this instant win lotto, the odds are reversed in your favour! There are 43 good balls and 6 bad in Boss The Lotto. Your task is to pick out the good ones. Pick good balls in a row and you win. Pick more and you win more. But be aware, if you pick a bad ball, it’s game over! That’s how simple Gamevy‘s (Gamevy is yet another new game provider at Pokies.com!) Boss The Lotto is. It’s all about luck and nerves: do you cash out now, or do you go for another ball that’s going to either boost your winnings or take it all away? What makes the choice especially exciting is just how much you can win. Keep picking a ball after a ball and you’ll notice that your win amount starts to rise faster and faster. First you need to pick six balls to win anything at all. Now you can either cash out or pick another ball. If you keep picking, you’ll see that the amount you win if you choose to cash out rises first by a dollar or two per ball. Then it starts to rise faster and faster and if you pick all the 43 good balls you’ll win an amazing, baffling, perplexing $/€/£2,500,000.00!! What makes this lotto game so special, is that you don’t need to wait until Saturday to check the lotto results. You either win or lose instantly and can play another game whenever you like. 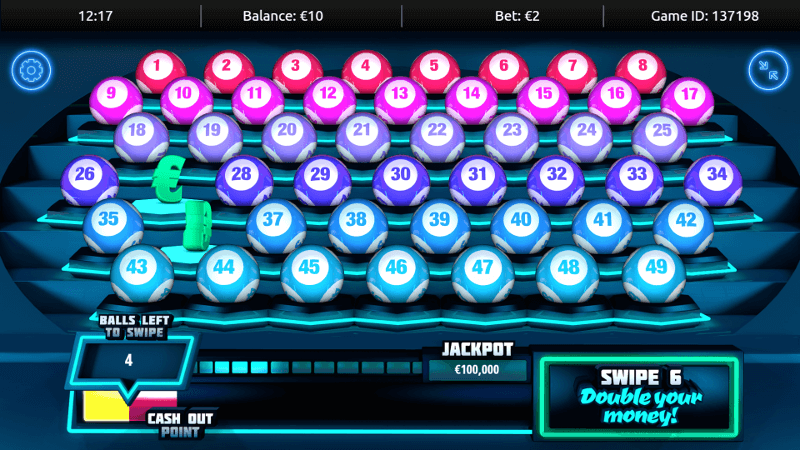 You can have another go literally wherever you are, as Boss The Lotto is a fully mobile game. You can play it on your iPhone, Android phone, iPad or Android tablet. Boss The Lotto is bound to be one of our most popular mobile real-money games, as it plays well even on small phone screens just like our other instant-win games. Note that you can also play Boss The Ball. It’s the same game with slightly different winnings and footballs instead of lottery balls. So if you’re a footie fan, search for Boss The Ball at Pokies.com mobile casino lobby. Sign up now and we’ll give you a free $/€/£5 to play with. You can play Boss The Lotto and any other games you’d like with the money. If you already are a Pokies.com member, sign in to play and to find out what bonuses await you today!